What’s the best retractable dog lead? Retractable or extending dog leads are one of my best purchases over the years. I love to walk with my dog, but often where we live it’s not safe enough to let my dogs off the lead completely. Having an extendable leash just gives that bit more freedom but still enough control should other dogs, cats or other distractions come in to view! Here’s my reviews and tips when looking for the best retractable dog lead around right now. Make sure that when you choose your dog leads that you have taken in to account how heavy your dog is and also how active or strong they are. The lead has to be able to cope with that. The length of the lead will mean you have less control the longer that it is, and the longer they are the less suitable I find they can be for larger dogs. Extendable leads often come in either cord or tape varieties. Again the type and weight of your dog will dictate what you should go for. Cord leads are often more suitable for smaller dogs. Heavy duty leads will have strong nylon tape. Also make sure that they feel comfortable in your hands and are easily gripped and used. The leads I’m reviewing here all have nice simple operations that can be done with one hand. Did you know that some areas don’t allow dogs to be on an extending lead? This is due to councils thinking that it’s more likely that owners will clean up after dogs on a short lead. Seems crazy but true. Flexi are a good make of extendable dog leads and I’ve used these often when walking my mum’s dog. There’s a few options on this page from them as they are one of the biggest brands around and do make a few different good ones. Coming in some different sizes and lead lengths this tape lead from Flexi is a good choice. If you have dogs up to 60kg in weight then their heavy duty large one with the 5 metre lead will be suitable. It also comes in Extra Small (up to 8kg), Small (up to 15kg) and Medium (up to 25kg). They have a couple of different lengths of lead as well but generally the longer the lead the less weight it will handle so bear that in mind. They also come in a variety of colours – pink, blue, black, brown, red and turquoise, so plenty to match your or your dog’s outfit! Another one from flexi and if you’re looking for a good lead for larger dogs that is also an 8m leash length then this is the one for you. If you have strong and active dogs then this one is also designed specifically for them. They do a couple of sizes, Medium (up to 25kg), Large (up to 50kg) and Extra Large (50kg+). The lengths of the leash are 8m although you can get a 10 metre variant in the Large size. They are slightly more expensive than the others on this page, but this is due to the fact that they are designed for the active and bigger dogs so that they can have the freedom on their walks they want! If you have one of these dogs you’ll know that a sturdier lead is a must! I’d say this is the best strong retractable dog lead and if that’s a priority for you then definitely check this heavy duty lead out. It’s definitely one of the strongest around. A lot of the leads around look the same so my tip for you if you’re wondering which one to go for is to check the reviews out on Amazon of what real owners think of them! This lead from GHB is a great medium sized extending dog lead. It’s good for dogs up to 50kg and has a strong nylon tape with a length of 5 metres. Plenty enough for them to be exploring! The lead has a button with 3 controls on it – short stop, lock and unlock. It’s all controllable with one hand and is a really easy operation. The lead comes in different colours too which I always like – you can get red as shown but also purple, black and blue. Another from Flexi – this one is a retractable cord lead so you don’t have a flat tape like many other leads. Sometimes I’ve found that tapes can get twisted and then the control is gone. With a cord you don’t have that issue. I think that cord leads are more suitable for smaller and lighter dogs though and this one comes in three sizes – XS, S and M.
XS is good for dogs (or even cats and rabbits!) up to 8kg and is 3m long. M is for up to 20kg and is 8m long (one of the longest dog leads on the page). They are a very good value dog lead and one that I recommend if you have a smaller dog! Finally we have this dog lead from Winsee which despite it’s rather understated appearance is actually a really good dog lead. It comes in a classic black plastic case and the 1.4cm wide tape/belt extends to 16ft (just under 5 metres). This lead is perfect for small and medium dogs up to around 50kg. What I also like about this is that the lead has reflective stitching in it which lends a little bit more safety to the lead than just a regular one. It has an easy to use button operation too – just press the button to stop and pull back to lock. Then push it forward to unlock. Of course, this best retractable dog lead article isn’t exhaustive. In my experience there are a lot of generic extending leads out there which are all a bit same-y if that makes sense – getting a good brand is my biggest tip when looking. After all, you want to keep your dog safe while on a walk! Author SarahPosted on July 11, 2017 February 10, 2018 Categories Outdoor Dog GearLeave a comment on What’s the best retractable dog lead? What is the best flea treatment for dogs in the UK? It doesn’t matter how clean your home is or how often you bathe your dog, fleas can become a problem and once they arrive you’ll know about it! Not only are they irritating for your dog but you can often find that you’ll suffer from bites yourself. It’s important to be on top of any flea situation as they can easily infect carpets and soft furnishings in your house. Check further down the page for my thoughts on the best flea treatment for dogs in the UK right now. How to tell if your dog has fleas? using a flea comb can pick up the dark specks or even adult fleas. what’s better – drops, a collar or powder? So which dog, flea and tick control is the best? There are a few different ways that you can deal with fleas, the most common being the drops that you apply to a dogs skin. Some people find that the drops are the most effective way but it’s a ‘your mileage may vary’ type of thing. Some will swear by the collars, some by powders – only you know how your dog and lifestyle is so choose what looks like will be the best option for you and give it a try. As with lots of pest control, the pests eventually become immune to the flea medicine, so if one way seems to not work don’t be afraid to try another brand or type of dog flea treatment. Remember as well that prevention is definitely easier than curing an infestation! One of the most popular brands for flea control in the UK is this one from Frontline. You basically squeeze the pipette of medication on to the dogs skin, normally at the base of their neck so they can’t lick it, and allow it to soak in. It’s waterproof so you don’t need to worry about bathing your dog and it coming off, or even taking them for a walk and them going for an impromptu swim! Each treatment lasts about 4 weeks. Frontline also has the advantage of killing ticks and lice which might be something to consider. There are different packs for different sized dogs so make sure you get the right dosage. It’s also a good flea treatment for puppies as it can be used from 8 weeks. Another good option is this spot on treatment from Beaphar – the active ingredient in it is Fipronil. It kills fleas and ticks for up to 5 weeks and is easy to apply with a pipette. You get 6 pipettes in a pack so that will last 30 weeks – over 6 months! Again, check the size of your dog and be sure to get the right dosage for him. Flea and Tick collars are another good option and this one, again from Beaphar, is a particularly good one. Because they last for much longer than the drops – 4 months instead of one month for each drop treatment, this can be good if, like me you’re not great at remembering when to treat your dogs! (I always try and add it to my calendar now). It’s impregnated with the chemical, is waterproof and is suitable for dogs from the age of 3 months old. It’s also a slightly cheaper way of doing it, so if budget is a consideration then I’d be inclined to give these a go. If your dog hates collars and is likely to pull it off this isn’t the thing for you! This is a slightly different idea and one that is completely natural – an amber dog collar. I’ve not used this myself but I’m striving to cut down on chemicals in our house so I’ll be giving this one a go shortly. It works by the natural chemicals in the amber being a deterrent to ticks. It also creates a small electro charge through the dogs fur – like a static charge – that stops small insects deciding that it’s a nice place to live. Intriguing huh? Definitely a unique kind of flea repellent. The reviews of this one are really good – you can see more of them here. Another option for people looking for a natural flea treatment for dogs is this one called Nature’s Healing Powder. It’s 100% natural and contains no man made chemicals so is safe to use in the home whether you have kids, babies or just want to be free from harsh chemicals. The flea powder can be used in two ways, first of as a topical powder application, applied to the dogs coat and bedding. You apply once a week for a minimum of 4 weeks until the fleas are gone. Secondly you can use it as a feed supplement to help with internal parasites. Again the reviews for this item are really favourable and it’s something I really recommend if keeping your house chemical free and looking for natural dog health supplements. Author SarahPosted on July 3, 2017 September 7, 2017 Categories Dog healthLeave a comment on What is the best flea treatment for dogs in the UK? If your dog has a sensitive tummy and doesn’t react well to what you put down for them to eat then you’ll naturally be looking for the best dog food for a sensitive stomach. It’s hard to give an absolute best recommendation because all dogs are different and what one will eat another surely will not. You may even see this happening at home if you have more than one dog! Many manufacturers will make a ‘sensitive stomach’ dog food as the need for it is increasing a lot more nowadays. Perhaps that’s because we’re looking to get the best for our dogs more nowadays or perhaps it’s because we’re becoming more informed about what causes bad dog wind or digestive issues and we want to sort it out! Either way there’s a huge choice and so you’ll certainly be able to try quite a few brands to see which one suits. My recommendation is to go with a small bag (if available) if you’re not sure and don’t want to waste the food. Sensitive dog food is good for all dogs who might have problems with allergies, diarrhoea, smelly wind or sensitive skin although if you’re concerned about any of these conditions and if there might be underlying issues do get in touch with your vet. It may be worth looking at grain free dog foods for sensitive stomachs and I have a page dedicated to that subject. The dog foods listed in this article are all complete dried dog foods. 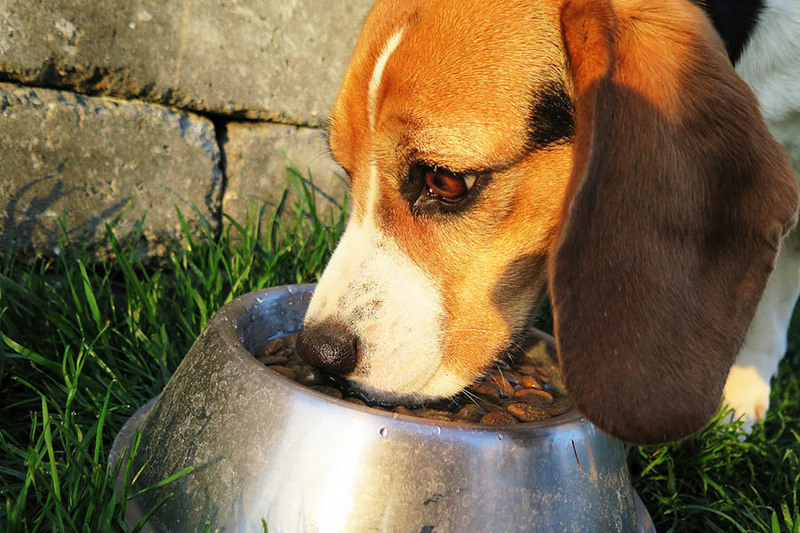 If you want wet dog food that are suitable for sensitive stomachs you might want to check out my article about the best grain free dog foods which does include canned and wet dog foods – you can find that here. One of the most popular brands on the market for sensitive dog food is Burgess. They have a great range of food which makes it my top choice too – they have three different flavours of adult dog food and a puppy food as well. The adult dog food comes in turkey, salmon or lamb flavours and the sensitive puppy food comes in a turkey flavour. Their food is free from maize, wheat, eggs, dairy, beef and soya which means many of the potential foods that can upset a dog are not included. The meat content is a minimum of 26% and rice is 26% and they have added vitamins and minerals to help with the all round health of your dog. There are a lot of positive reviews for this product on Amazon – it’s a really popular choice! Another popular choice is this dry dog food from Burns. It comes in two different flavours – pork and potato and also duck and rice. They also do a range of sensitive dog treats too – see here. It’s a hypoallergenic and complete dog food so if your dog enjoys eating it you wouldn’t need anything else. It’s also wheat, dairy, soya and beef free and also is free from artificial colourings and preservatives. It’s beneficial not only to dogs with a sensitive stomach but also for those with sensitive skin. It’s also available in small 2kg packs should you want to try it out at a lower cost. This dog food comes in the flavour of white fish and potato which is the only one they have that falls under the ‘sensitive dog food’ category. However it’s another popular dog food that helps with delicate digestions and also for dogs with sensitive skin. They also do their own range of sensitive dog treats too which you can see here. Ocean fish is a great option for sensitive dogs as it’s a really high protein yet easy to digest. This food is completely wheat, beef, soya and dairy free. It’s one of the more expensive foods when you look at the cost per kg but again comes in a smaller bag should you wish to test it out. One of the major brands in the UK and a well known one is Wagg. This is probably the cheapest of the lot when looking at the cost per kg which is a major benefit to some! The dog food comes in just one variety – chicken and rice. It is completely wheat, wheat gluten, dairy and soya free and has no added sugar. There are a variety of added vitamins and minerals to help with a glossy coat, healthy teeth and strong immune system. Wagg also do their own version of sensitive dog treat which you can see here. The main benefit of this product is the price – many of the positive reviews come from people who couldn’t afford the more expensive varieties but have found this one to be as good but much cheaper. Eukanuba is one of the more premium of the mainstream brands of dog food and was one of the first brands I was introduced to when I got my first dog many years ago who also had a sensitive tummy. This one that they do currently is a chicken and turkey flavour. It’s a complete food with added vitamins and probiotics which also help your dogs immune system. They don’t state whether it is wheat or gluten free so this might be worth checking if it’s important to you. Their dog food is very high quality and has been made using high tech methods – this one even includes their DentaDefense technology which apparently helps to clean your dog’s teeth as he eats. Again, don’t be afraid to try out some different foods for your dog. Dry dog food may be better or you may find that canned, wet dog food will be best for your dog’s sensitive stomach and digestive issues. It might take a while to get there but it will be worth it in the end to get a much happier dog! If you have a dog with a sensitive stomach then you’ll know that it can be a pain to manage and to get right. It’s hard to watch your dog react badly to food, especially if it was expensive or that you’ve just bought a big bag of! However if, like me, you want your dog to thrive and to get them well and eating it’s worth trying lots of things to see if it will help them. Here’s some ideas on how to help dogs with sensitive stomachs. Of course, if you’re worried it might be something more serious and your dog has been vomiting or has had diarrhoea for a couple of days, take your dog to the vet and get him checked over! The first thing that I’d suggest before doing anything drastic is to monitor your dogs eating habits. Are they eating too quickly and then being sick afterwards? Are the only eating dog food or are they snaffling left overs from your plate? Maybe they have a habit of rifling through the bin and eating whatever they get their hands on. It’s a good idea to just take a look at their current habits because that might show you straight away what the problem is. If someone is feeding them scraps from their toast then perhaps it’s that which is upsetting them and cutting out the treats might help. 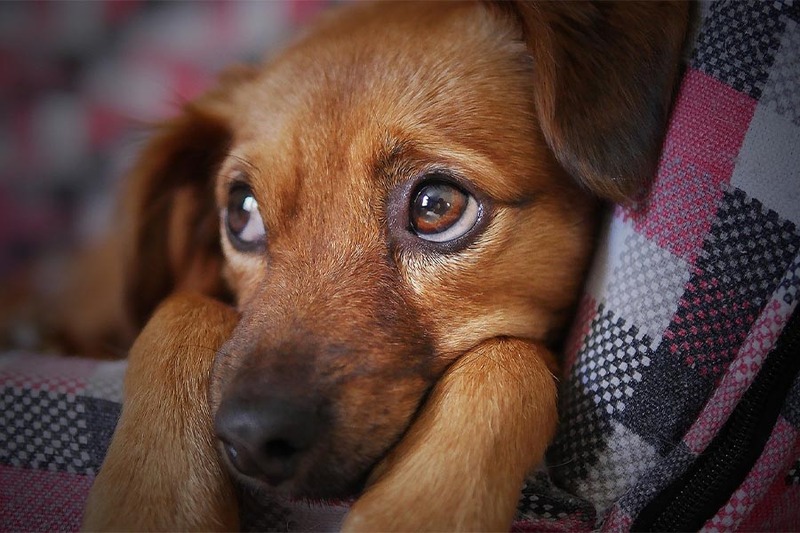 Dogs will sometimes get an upset tummy if you change them from what they are used to, so if you’ve recently changed their food then it might be worth going back to your previous brand and seeing if that helps. If your dog is not doing good with what they are eating and it;s not because of a recent change then perhaps a better quality dog food will be good for them. When you find something that works – stick with it as much as you can. Again changing it might bring back an upset tummy. Finally – if you’re still not getting anywhere with dog food you could try to go down the grain free dog food route. Some dogs simply can’t digest grain which is the cause of the stomach upset. After all, grain is not a really natural substance for them to have in great quantities so it makes sense to try to eliminate it. Going grain free can really help with sensitive stomachs and is definitely something that is worth trying. You might even find that going grain free stops all the dog farts from smelling so bad – got to be worth a go huh? I’ve reviewed some of the best grain free dog foods in the UK to give you a head start on which brands might be worth trying out. Finding a dog food that will not only appeal to your dog but that will also make you feel good about buying is a tough task. You want the best, but that’s no good if they don’t eat it! Unfortunately some dogs are just very fussy and it can take trial and error. If you’re looking to try a new, wet dog food then I really recommend the Naturo range. It’s one of our favourites here! I have mentioned it before in my guide to the best grain free dog food, but I wanted to go a bit more in depth and talk about the other options available. So here’s my Naturo dog food review and I hope that it will help you decide whether it’s worth trying out or not. I’m a big fan of the Naturo food brand – I like that they are a UK company and source their ingredients locally. I like that they provide high quality dog food and I like that they don’t add filler ingredients. All in all they are well worth trying if you have high standards for dog food like me. Naturo only use natural ingredients and one look at their ingredient list and you’ll instantly recognise what’s in there. There”s nothing that is hard to pronounce or sounds like it might be artificial! Each flavour has meat as the main ingredient and it takes up around 60%. The further ingredients are simply rice (or potato if you go for the grain free option) and vegetables – normally carrots, peas and potatoes. They also add some essential vitamins and minerals to the food meaning that it’s really an all round healthy choice. The image above shows their variety pack which gives four different flavours – perfect if your dog likes to have a bit of variety in their diet or if you want to see which one they prefer. The pack has chicken and lamb, lamb, duck and also salmon flavours. As well as these there are a few other options of dog food in the Naturo range. They also do a Senior dog food which is turkey, rice and vegetables; two grain free varieties that are chicken and potato and also salmon and potato; and they also do a light chicken, rice and vegetables option for dogs that need to lose a little weight. As well as giving my own thoughts I really like to look around the internet to get another view of what people have said about this dog food. Of course there are always reviews stating that their dog wouldn’t touch the food and it’s hard to get an accurate picture. Really though, they have a great reputation and their reviews on Amazon are consistently high. Overall the main positive is that it’s a good value dog food for what you get. There had been a bad review a few years ago due to the packaging, but this doesn’t seem to be an issue now. Some people don’t seem to like the content of rice and potato in it and would prefer less but that’s a small minority of the reviewers. Overall we love the Naturo range, it does what it says on the tin and if your dog enjoys it you can be sure that he’ll be getting a good diet. Definitely one to give a try if you’re concerned about what your dog is eating. If you live in a carpeted house with your pets then you’ll likely be wondering how to keep your carpet clean with dogs roaming around it all day. Here’s some top tips to help you combat what could be a smelly situation. Prevention is the best cure. Make sure that you have a good door mat at your front and back door to catch wet feet and mud. Getting your dog in the habit of getting his paws wiped before entering the house is also a good idea. Just keep an old towel by the door. Create a good cleaning schedule. How often you need to vacuum or carpet wash might depend on what dogs you have, their hair and whether they shed or also your time, but having a schedule where you commit to cleaning daily, every other day or whatever suits you will help. Keep on top of accidents – always clean and deodorise straight away any area where dogs have either had a toilet accident or been sick. If you don’t it will soak through to the base of the carpet and you’ll struggle to clean it well. Have on hand an accident cleaning station with all you need to attack the accident spot – bicarbonate of soda is a good natural deodoriser. Get a good quality vacuum cleaner (you can see my top picks here) – it will really help to pick up the dog hair. Groom your dogs regularly to help with shedding hair. A good brush will often pick up any loose hairs and you’ll catch them before they go on the floor. Shampoo the carpet regularly. It’s a pain to do sometimes but it’s worthwhile to keep the carpet fresh smelling. Either get yourself one that you can use from home, hire a professional cleaner to use yourself or get someone in to do it for you. It’s really worth keeping on top of the carpet as it’s so easy for them to absorb the smells and making your house an unpleasant place. Carpets are expensive to replace as well so the more you look after them the more you’ll save in the long run. First of all – patience! Unless your dog is used to going for really long runs, they’ll need time to get themselves used to it. Even if they are full of energy at home, don’t mistake this for their ability to run 5km straight away – it doesn’t quite work like that. try building up your runs. Either start with a short run and build up each time you go out or try walk runs for a set period of time. 10 minutes is a good amount to aim for the first time, but if you or your dog is out of shape, don’t be afraid to go less and work up. you can get running leads that attach to your waist and these are a good idea so that you can run better yourself, keep your balance and maintain good form, but they aren’t necessary especially when starting out. A normal short lead will work fine – best to keep your dog close to you. If your dog likes to pull then you might struggle so make sure they are well behaved on the lead or up your training in that sense. Can puppies run with me? I’d advise against running with really young dogs – yes they do have the enthusiasm but they are still growing. Best to wait until they are probably about 18 months old or so and in the mean time make sure the are well behaved on the lead and not pulling when walking. If in doubt – check with your vet. Is my dog healthy enough for it? Only you can answer that but if you go slowly and build up your training with your dog I think you’ll be able to spot if your dog is struggling and can’t do it. Just be aware not to push too far, too fast. I hope you find these tips helpful and that it helps both you and your dog to be getting yourselves more active. It’s such a great activity – easy, cheap and your dog will love you for it! If you’d like some more ideas for getting fit with your dog then you might like this article I wrote here. We all love Christmas don’t we? A time for chilling out with the family, opening presents, music and fun. Of course, excess happens too, especially in the food and drink area. Sometimes this can pose dangers if your puppy manages to get their paws on a chocolate that fell on the floor or your dog ate a mince pie. So what dangers should we be on the lookout for this Christmas? chocolate – toxic to dogs. grapes – raisins/currants etc – can cause kidney problems. This means fruit cake, mince pies and Christmas pudding are definitely out. onion family – this can also be toxic to dogs so be aware, especially if you’re giving them a bit of Christmas dinner to make sure there are no onions in there. alcohol – it’s just not good for dogs, similar to how it is for us. Keep out of reach. Too much human food – sometimes it can just not suit your dog’s tummy, especially if they aren’t used to it. Definitely keep all foods away from dogs and don’t feed them tidbits of course. Keep any leftovers out of reach too, especially if they might have gone bad. The best bet is to make sure you have plenty of dog friendly treats on hand, especially if you have over zealous guests who just want to make sure that your dog is enjoying the festivities! So, what happens if your dog accidentally eats something they shouldn’t? Depending on what it is of course, you should definitely monitor your dog for signs of illness. If you know what they’ve eaten and you’re concerned it’s something that’s really bad for them then I’d definitely get in touch with your vet straight away. over excitement – yup, I think I’m with them there. But seriously, they might need to find somewhere calm to be, especially if you have unfamiliar children around. Being proactive is probably best to make sure everyone stays happy. non food items that look good to chew – ornaments, wrapping paper, crackers, bows. The list is endless! If your dog is a chewer then make sure all ornaments stay out of reach and papers are cleared away. Christmas trees – of course there are dangers with them falling over, chewing them up etc, but if you also have a real tree the pine needles might upset your dogs tummy if they eat them. Although it can feel alarming to think about, you’ll probably be well aware of your dog’s ability to snaffle food when you’re not looking or chew up all that is around it. Just be aware of the extra things that are around and take precautions as you would normally and you’ll most likely be fine.